Last year, I published a list of Ten Awesome Forgotten ’80s Movie Songs. It was intended to celebrate one of the greatest decades for mainstream motion picture entertainment, as well as the strong connection shared by films and music during that time. To my pleasant surprise, the piece proved quite popular. Apparently, I wasn’t the only one with this particular obsession. There were far more than ten to choose from, though, which meant some really great tunes got left off. This could mean only one thing: a sequel needed to be put into the works. Below are ten more terrific songs that, for one reason or another, never made the impact of Ray Parker Jr.’s “Ghostbusters,” Huey Lewis and the News’ “The Power of Love,” Kenny Loggins’ “Danger Zone,” or any of the other seminal ’80s movie themes. I hope you have fun discovering or re-discovering them. “All For Love” by Nancy Wilson (from Say Anything…) – Cameron Crowe’s directorial debut is widely considered one of the greatest teen romances ever made. It details the attempts of insecure slacker Lloyd Dobler (John Cusack) to win the heart of Diane Court (Ione Skye), a highly-driven girl he perceives to be out of his league. After enduring a betrayal by her father, who has embezzled from his place of employment, Diane realizes that, for all his aimlessness, Lloyd is the one person she can unfailingly count on. The final scene finds them on a plane to England, where she is going to study. Lloyd is deathly afraid of flying, and in this moment, Diane gets the opportunity to support him, just as he’s supported her. Together, they wait for the seatbelt light to go off – a sign, she tells him, that everything is okay. It finally dings, the screen cuts to black, and “All For Love” by Heart’s Nancy Wilson (Crowe’s then-wife) begins playing over the end credits. “The Best Man in the World” by Ann Wilson (from The Golden Child) – Nancy Wilson’s sister and fellow bandmate Ann also did some movie music in the ’80s. “Almost Paradise,” her 1984 Footloose duet with Loverboy’s Mike Reno, was a top ten hit that spent 13 weeks in the top 40. In 1986, her voice once again graced the big screen with “The Best Man in the World,” the theme from Eddie Murphy’s The Golden Child. Perhaps one of the reasons this catchy song isn’t well remembered is because the movie that spawned it was poorly reviewed and not as financially successful as Murphy’s previous works, Beverly Hills Cop and Trading Places. In fact, it was really his first stumble as a leading man. Still, Wilson has always had an amazing set of pipes, and anchored by a trademark ’80s synth-bass, “The Best Man in the World” gets your toes tapping. “Into the Night” by BB King (from Into the Night) – The late BB King had a long, illustrious career. That soulful voice could make anything sound amazing. King had lots of hits, but when news broke of his passing in May of 2015, I immediately wanted to listen to “Into the Night,” the bluesy song he recorded for John Landis’s mostly-forgotten 1985 comedy about an insomniac (Jeff Goldblum) running for his life following a chance encounter with a jewel smuggler (Michelle Pfeiffer). For my money, it represents a genuine legend at his finest. “Seven Day Weekend” by Jimmy Cliff and Elvis Costello (from Club Paradise) – Harold Ramis directed and/or wrote some of the most beloved comedies of the 1980s, including Stripes, Ghostbusters, and Caddyshack. His 1986 comedy Club Paradise is not his finest work. (Ramis has said that he was mid-divorce during its production, and consequently not at his comedic peak.) The story of an injured Chicago fireman who uses his disability money to retire to a small Caribbean island, Club Paradise boasted an all-star cast that included Robin Williams, Rick Moranis, Eugene Levy, Andrea Martin, and the great Peter O’Toole. Unresolved script problems didn’t give them much to work with, though. Comedian Harry Shearer, who did a rewrite, was so appalled by the final product that he had his name taken off the credits. Today, Club Paradise has a small cult following, but largely remains a great example of extraordinarily talented people coming together to make a turkey. 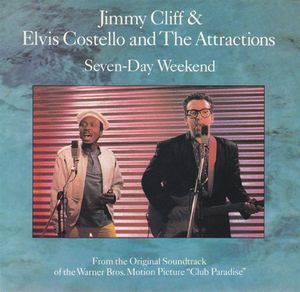 The song “Seven Day Weekend” by Jimmy Cliff and Elvis Costello remains its greatest asset. “Nothing in Common” by Thompson Twins (from Nothing in Common) – “Hold Me Now.” “Doctor, Doctor.” “King For a Day.” These are some of the biggest hits from Thompson Twins. One of their most emotional songs, however, was the eponymous theme to the 1986 Tom Hanks/Jackie Gleason comedy Nothing in Common. The movie was about a man dealing with his difficult father, and the song reflects some of the story’s themes. Singer Tom Bailey’s vocals have an especially haunting quality. Whether or not he identified with the events of the plot is unknown, but there’s no doubt that he gives the tune its hard-to-deny kick. “Coming to America” by The System (from Coming to America) – Eddie Murphy had far more luck with this 1988 comedy than he did with The Golden Child. It was a huge hit that continues to maintain its popularity. The System — best known for their top 5 smash “Don’t Disturb This Groove” — performed the title tune, cleverly incorporating a short sample of the National Anthem in its chorus. Despite the movie’s success, the song never really caught on, peaking at a lowly #91 on the Billboard Hot 100 chart. Just try to get it unstuck from your head after giving it a listen, though. “Romancing the Stone” by Eddy Grant (from Romancing the Stone) – Romancing the Stone and its sequel, The Jewel of the Nile, made almost the exact same amount of money at the U.S. box office ($76 million vs. $75 million). Musically, however, the sequel outperformed the original, spawning Billy Ocean’s hit “When the Going Gets Tough (the Tough Get Going).” The original’s theme, performed by “Electric Avenue” singer Eddy Grant, is equally catchy. The difference most likely lies in the fact that, despite commissioning it, the producers of Romancing the Stone only used the guitar part in the film, thereby preventing audiences from truly discovering the composition. The song also did not appear on the soundtrack album. Let’s take a moment, then, to give this bouncy number its proper due. “Ruthless People” by Mick Jagger (from Ruthless People) – Mick Jagger is rock-and-roll royalty. He’s also long been associated with movies, thanks to documentaries like Gimme Shelter and acting performances in films such as Performance and Freejack. He also recorded the title tune for 1986’s Ruthless People, a kidnapping comedy from the directors of Airplane! The movie did very well at the box office, giving stars Danny DeVito and Bette Midler great roles and launching the career of Bill Pullman. For some reason, though, it hasn’t held up. It doesn’t come immediately to mind when recalling the big comedies of that era. This would probably be a fun one to revisit on DVD. For now, we’ll just revisit Jagger’s percussion-heavy song. “Feel the Heat” by Jean Beauvoir (from Cobra) – Jean Beauvoir was a former bass player for The Plasmatics, a punk group known for outrageous onstage antics. (Google them if you’re unfamiliar.) After a stint with Steven Van Zandt’s group Little Steven and the Disciples of Soul, he went solo. His song “Feel the Heat” was reportedly hand-selected by Sylvester Stallone to serve as the theme for his cop thriller Cobra. With its pulsing bass line and overall badass vibe, it was a perfect fit. The tune didn’t get any further than #73 on the pop charts, but it still sounds fairly current, which is a feat in and of itself. Beauvoir currently oversees a Norwegian children’s program called City of Friends that is broadcast around the world. So there you have ten more awesome forgotten ’80s movie songs. I hope you enjoyed them! I’ve got more, so look for another installment down the road.